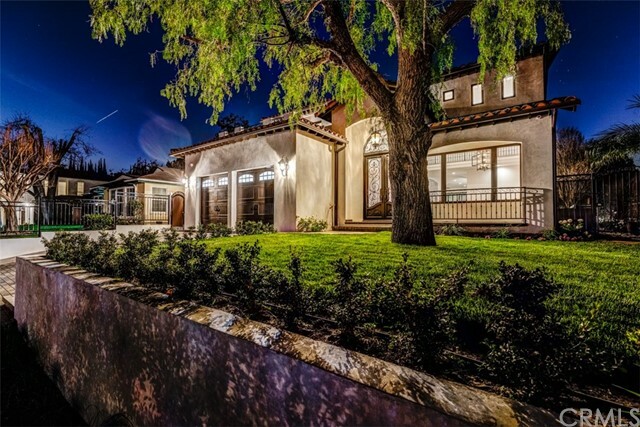 A completely remodeled and never lived in since redo, this Custom, Majestic Mediterranean Home located in the coveted Toluca Lake district. This newly completed amazing one-off design has it all! You won&apos;t need a vacation because this is paradise! From the minute you walk in you are mesmerized, the 20&apos;+ ceilings, double marble fireplace, wine cellar, wood floors, wainscoting, specialty chandeliers ... only the best! The Chefs kitchen that is designed for entertaining with all stainless Thermador appliances, double farm sinks with top of the line quartz counter tops with custom marble back splash. CBW doors lead out to the lavish pool and backyard. Up the oak wood stairs a Master Retreat fit for a King and Queen with it&apos;s own large private veranda. Also the master has its own fireplace and bath with Italian White Marble floor to ceiling. There are another 4 Bedrooms and 4.5 baths. This was a 99% remodel and has just been completed. The home has two upstairs Verandas and a covered patio downstairs by the pool. Call your Realtor today before this opportunity is gone forever!